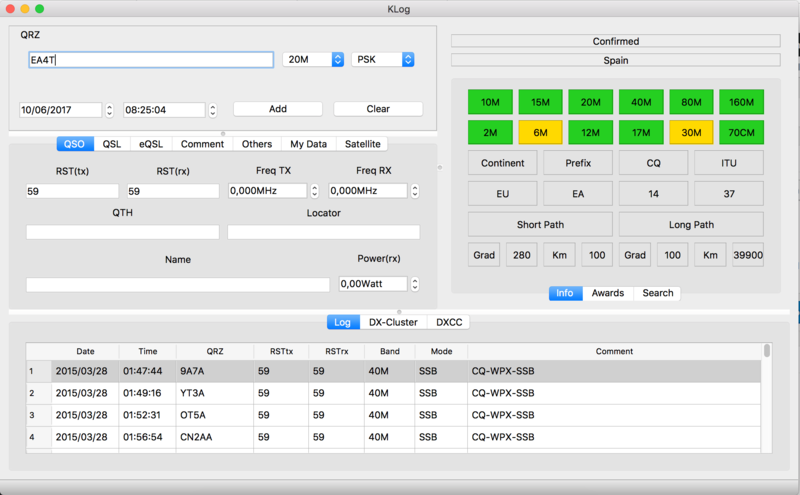 KLog is a multiplatform free hamradio logger, the only one able to run in Linux, Windows and macOS! KLog is providing QSO management, useful QSL management DX-Cluster client, DXCC management, ClubLog integration, DX-Marathon support and much more! KLog is today already in several languages: Catalan, Croatian, English, Italian, Japanese and Spanish. You can also see some Screenshots of KLog to see what it looks like. If you want to help us, please visit the Contribute page and find your way to improve KLog! eQSL, LoTW management (still not fully integrated). DX-Cluster client that will show you the status (worked, needed…) of each spot. I have just released 0.9.7.2 fixing a bug preventing the frequencies shown being higher than 99.999 MHz. As it was easy to fix and it could affect VHF and higher freqs users (satellite, EME operators…) I decided to release quickly.